What is happening on camp…? Check out this blog which will be updated during the course of the camp with information and photographs. After a safe and smooth crossing our ship docked at the Hoek of Holland on Sunday morning and we were collected by coaches and taken to the campsite in Ommen. The campsite is called Gilwell Ada’s Hoeve and located in the woods a couple of kilometres from the town of Ommen. After arriving the rest of the day was spent getting to know the Dutch Scouts and setting up camp. The tents were put up and the kitchen areas made, including the construction of some very impressive tables and benches made out of pioneering poles. The Dutch leaders organised some getting to know you games and we were introduced to the theme of the camp – “stranded islanders” – and a visit from the local “tribal leader” King Euuuggghhhh. Check out some photographs of the day below. Wow….what a scorchio! Temperatures hit 30 degrees today so we decided to change around some of the programme and postpone a hike and visit the local outdoor swimming pool instead. The day started with an inspection of all the kitchen areas and tents and all the leaders were pleased to see the how well the Scouts had settled in. After that we set off for a short walk to the swimming pool. After 3 hours at the pool we then went into Ommen for a little shopping time. We think the weather might be cooler and wetter tomorrow….not a bad thing. Everyone had plenty of sun today. Well the predicted rain arrived on queue and we all awoke to the sound of rain on our tents. The wet weather stayed with us all day, giving us some pretty soggy children. With typical perseverance though we went ahead with the hike which saw the Scouts being in placed in mixed groups of English and Dutch Scouts and following a route set out by the Dutch Leaders. The route took the Scouts through the forest surrounding Ommen and included a really tall tower which allowed you to look over the forest canopy. 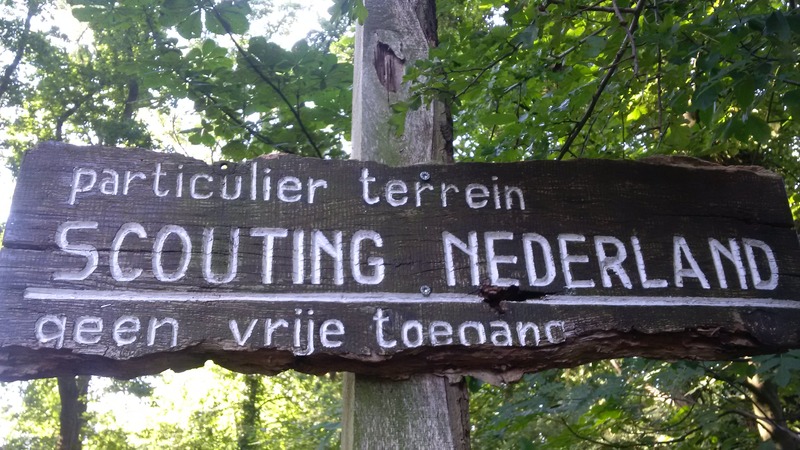 The Dutch Leaders had set out many different navigation methods for the Scouts to use on different sections of the hike, including stripmaps, photographs, line drawings and different coloured thumb tacks. It was a challenge at times and not helped by the weather. Everyone made it back wet but safely, and the day concluded with some small games and challenges for the Scouts to do in Patrols and a short campfire before bed. After the wet of Tuesday the sun shone again for us giving an opportunity to dry out wet clothes and boots. We began the day with an all Group flag break with the flags raised by English and Dutch Scouts and the English Scout Law read out by Aidan and the Dutch Scout Law by a Dutch Patrol Leader. Today we went on a visit to a local theme park called Hellendorm, which was just a short coach ride away. This was a joint trip with the English and Dutch Guides. There was lots to do in the park with rides such as rollercoasters and log flumes. It was really busy. Apparently it was the busiest day for three years, and the park had to ask people not to visit as it was full! The rides were great and the Scouts got to try out most if not all of them. The park also had a water park with 11 different slides which the Scouts visited in the afternoon. Everyone had a great time….Leaders included (as you will see from some of the photographs). In the evening we played a wide game that was organised by the Dutch Leaders. It was a sort of smuggling game with teams trying to collect and smuggle pieces of a puzzle. Pictures are here, hope you enjoy them. The forecast for today is for a really hot day with the temperature expected to reach 32 degrees. We really figured that the Scouts would want to keep cool, so the Dutch Leaders arranged for us to go back to the outdoor swimming pool that we had visited earlier in the week. In the afternoon we returned to camp and played some water games. I am sure there was an aim to the game, but for the most part it just consisted of Scouts shooting each other with water pistols! They loved it! In the evening we had another wide game. This time it was joint with the English and Dutch Guides. The game was a trading game where teams could collect and trade resources to make points. The team with the most points wins. Lots of running around between different posts. One interesting sight as we walked into Ommen to the swimming pool were tigers and camels. Just down the road from Ada’s Hoeve a circus has set up and when we walked past the tigers were in their cage sunbathing and the camels were wandering around the field. Not what you expect to see on a summer camp in Holland. Not quite as many pictures this time….must have been the heat. Friday was the last full day on camp. The activities for the day centred around the campsite with three different bases. Bottle rockets, water rounders and mini-Olympics. We also started to strike camp by taking down all the heavy canvas tents and dining shelters. The weather was again really hot so we took the chance to get them down dry. With no dining shelters the Scouts cooked in one big group. At the end of the evening there was a full Group campfire in the main campfire circle at Ada’s Hoeve. Each section contributed to the campfire with a song or a sketch and the Scouts led the Group in singing On Ilkla Moor Baht ‘at. The Scouts then slept under the big event shelter. Tomorrow we leave Ada’s Hoeve and head to The Hague. Time to leave Gilwell Ada’s Hoeve. What a relief that we got the canvas down yesterday, as we awoke this morning to rain. Thankfully it didn’t last log and the sun came out before we left. It was a lot of hard work to get the equipment and bags packed away in time for a flag down ceremony at 11:30. We then had to be on the coaches for 12:00 sharp. All the Scouts worked well and we got it done on time. At the closing flag down ceremony, Wim Kaminga the Number One for Camp reflected on what has been a really good camp. This camp was the 46th joint camp between the Mohicanen of Ilkley and The Hague and it has become something of a tradition to say that each camp has been the best camp ever. Wim did not disappoint! We also took the time at flag down to recognise two of our Patrol Leaders, Adam and Jacob Cooke, who have achieved the Chief Scout’s Gold Award. This is the highest award that can be achieved in the Scout section, and takes a lot of hard work and commitment. It was great that Wilf could present Adam and Jacob with the award in front of the whole Group. The Scouts are now in the Hague and we hope have a great week. Photographs of the last day below.